We’d love your help. Let us know what’s wrong with this preview of Rakasha by Robert Davis. Dressed in the skins of breathtaking beauty, this man eater seeks more than the lives of its victims, as its bite claims their flesh and their soul. Now the creature has slipped from the jungle and walks amongst us. Join Robert Davis in this collection of short stor In the ancient jungles of the east stalks a creature. To ask other readers questions about Rakasha, please sign up. 4.5 Stars. Where do I even begin with this? So the author warns all readers in the beginning of the violence, sexual nature and gore and if you dont like these things don't read this book. Well I am not one of these people I like all those things I however did not realize the degree of them! The Rakasha demon..she crazy!! The opening story of a biker who encounters the Rakasha left me with my jaw on the floor. Next was the longer stories of the origins of the demon and what not. I was glued to t 4.5 Stars. Where do I even begin with this? So the author warns all readers in the beginning of the violence, sexual nature and gore and if you dont like these things don't read this book. Well I am not one of these people I like all those things I however did not realize the degree of them! The Rakasha demon..she crazy!! The opening story of a biker who encounters the Rakasha left me with my jaw on the floor. Next was the longer stories of the origins of the demon and what not. I was glued to the stories wanting to know more yet I was freaked out and mortified at times as well. Chapter 8 is perhaps one of the most disgusting things I've ever read but it was extremely good as well! Most people who know me suspect there's something deeply wrong with me. When given the choice between reading an uplifting tale of hope and love, or reading something terrifying and/or blood-splattered, I'll take the ghosts and gore nearly every time. That's somewhat problematic of late, as the pickings have been slim for such content. Then I was exposed to this. A series of short pieces dealing with the rakasha, a tiger-demon that makes its home in the jungles of India - though the stories thems Most people who know me suspect there's something deeply wrong with me. When given the choice between reading an uplifting tale of hope and love, or reading something terrifying and/or blood-splattered, I'll take the ghosts and gore nearly every time. That's somewhat problematic of late, as the pickings have been slim for such content. Then I was exposed to this. 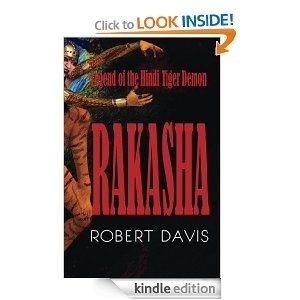 A series of short pieces dealing with the rakasha, a tiger-demon that makes its home in the jungles of India - though the stories themselves cover a much wider hunting ground - Rakasha connects early with the unfortunate end of a foul-mouthed, drug-dealing biker on the run. Despite the short length of the pieces, each of the characters felt as fleshed out, if not more so, than those appearing in much longer fiction. From our unnamed biker friend who serves as our introduction to Jeff the church-appointed monster-slayer, every one of them had some amusing dialogue snippets and at least one aspect to love them for (or love to hate them for, in the case of the Rakasha her/itself.) The settings were interesting and varied, and the description sold me on the oppressive claustrophobia of the jungles and the aura of mistrust and poverty surrounding the small villages where the rakasha hunt and play. The book as a whole was very vivid and visual in nature, providing some great "mental movies" as I cast actors and considered what it'd be like to see it on the big screen. Most of my reading time is spent fretting about dialogue and individual connections, the intangibles that often end up difficult to translate into film or television, but Rakasha felt almost like a screenplay, begging to put in an appearance on late-night television or on the silver screen. There's really not much negative to be said about this one; it's certainly one of the more enjoyable things that have crossed my reading shelf in some time. If anything, it's that I want more. Further expansion on the mysterious monster-hunting order, more background on Jeff and his priestly pal, perhaps the continued exploits of the younger Rakasha. Not that it doesn't feel complete as is, just would like more. There's a couple of awkward sentences, but overall they fit the "voice" of the book, and the meaning is still clear so no major worries there. When it comes to the horror genre, I prefer to watch it rather than read it however I was pleasantly shocked when this was recommended through Amazon. The collection of short stories were intriguing as well as detailed well. The first story caught me off guard in a way that every horror/thriller watcher/reader loves. I wasn't aware of what was happening until it was too late and even then my jaw was hanging down in shock after the fact. I wasn't prepared to be sucked in quite as quickly as I was When it comes to the horror genre, I prefer to watch it rather than read it however I was pleasantly shocked when this was recommended through Amazon. The collection of short stories were intriguing as well as detailed well. The first story caught me off guard in a way that every horror/thriller watcher/reader loves. I wasn't aware of what was happening until it was too late and even then my jaw was hanging down in shock after the fact. I wasn't prepared to be sucked in quite as quickly as I was and it didn't take long to devour it. I'm bias. I edited this book. It is a great dive into the world of the Rakasha. It also gives you a great taste for RObert's world of Demons and Demon hunters. This book will leave you wanting more. My view on this book is going to be skewed, but I thought it was very good, with tight story telling. The warning about 'immature humor and gore' were dead on, but neither stopped me from enjoying this small novella. if you enjoy horror, this is a must read. This is a very interesting and well written book. It is adult in content and humor but to in a gratuitous way. Learn, if you are not weak, about a Demon who would love to have you for dinner. It weaves an interesting twist on the power of addiction and the extraordinary madness it can lead to. A master of shock and horror, Robert Davis presents a seductive, man-eating tigress whose bite creates a perverse addiction for being eaten! The stories take the reader around the world to exotic and interesting places and times in history. The lovely, irresistible woman that is Rakasha takes you to heights of horro Learn, if you are not weak, about a Demon who would love to have you for dinner. It weaves an interesting twist on the power of addiction and the extraordinary madness it can lead to. A master of shock and horror, Robert Davis presents a seductive, man-eating tigress whose bite creates a perverse addiction for being eaten! The stories take the reader around the world to exotic and interesting places and times in history. The lovely, irresistible woman that is Rakasha takes you to heights of horror you may not want read about—be prepared. Just as the bite of Rakasha forces you to come back for more, the curse of Rakasha reaches out of the pages and bites the reader and forces him to crave more and read on in spite of himself. Reader beware. "I have been a computer geek, Avid FRPG player & game master, and enjoy other hobbies from off roading, to camping, hiking and shooting. I also am a prolific writer, who has decided over the last couple of years to take my craft seriously. To that end I am now an Indie Author, whose experiences, views and imagination all are combining to create worlds of adventure and fun. I hope you enjoy my "I have been a computer geek, Avid FRPG player & game master, and enjoy other hobbies from off roading, to camping, hiking and shooting. I also am a prolific writer, who has decided over the last couple of years to take my craft seriously. To that end I am now an Indie Author, whose experiences, views and imagination all are combining to create worlds of adventure and fun. I hope you enjoy my works as much as I enjoy writing them."